President Bashar al-Assad accepted the cabinet's resignation following a meeting on Tuesday. President Assad is expected to address the nation in the next 24 hours to announce he is lifting the emergency law and restrictions on civil liberty. The president has appointed outgoing Prime Minister Muhammad Naji Otari as caretaker prime minister until a new government is appointed, the official Syrian news agency has said. A new government is due to be appointed within 24 hours, but there is word the changes will be "beyond expectations", the BBC's Lina Sinjab reports in Damascus. The government has little power in Syria, where it is concentrated in the hands of the president, his family and the security apparatus, observers say. Mr Otari has been prime minister since September 2003, with at least four cabinet reshuffles over the last eight years. A former parliamentary speaker and long-serving member of the ruling Baath party, he has also served as mayor of his home town and Syria's second city, Aleppo, and as governor of the province of Homs. Mr Otari's government was a mix of Baathist and non-Baathist ministers, and many are expecting the new government to be of new blood from outside the Baath Party, our correspondent adds. Tens of thousands of people have been staging a demonstration in central Damascus, as well as in other major cities, in support of the president as he attempts to reassert his authority. But tension has been rising in the cities of Deraa and Latakia where at least 12 people died over the weekend, our correspondent says. There are hopes that President Assad's talk will help to defuse tension, but many are fuelled with anger over the latest deaths, she adds, and there is talk of a bigger "day of rage" on Friday. Mr Assad is trying to quell pro-democracy protests against his regime that human rights groups say have left more than 60 people dead. 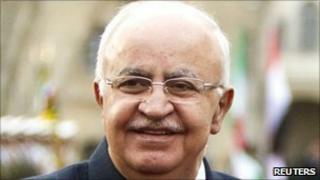 The unrest has become the biggest threat to the rule of the president, who succeeded his father Hafez on his death in 2000. Syria's emergency law, which effectively suspends most constitutional protections, has been in place since the Baath Party came to power in a military coup in 1963. Syrian governments have justified the continued imposition of the law by the state of war that exists with Israel, and by threats posed by militant groups. The current turmoil in the country started earlier this year after the arrest of several teenagers who scrawled anti-government graffiti on a wall in the southern city of Deraa, and quickly spread to other provinces.